Aloe vera is a type of cactus plant that grows and is cultivated widely all over the world and mainly under temperate weather conditions. For thousands of years, the liquid inside this plant has been used to treat all types of disorders of the skin and the body and today it is an ingredient that is widely used in skin and hair care products. So, here is a look at some of the uses of Aloe vera and its benefits for your skin and hair. Aloe vera creams and gels are extremely helpful in moisturizing the face. Aloe itself is a moisturizer soaking easily into the skin and reducing dryness and flaking. In addition, in a gel form, aloe forms a moisture barrier which holds in your skin’s natural moisture. The moisture formed can help prevent the drying out of your skin by the sun or indoor heating. So, when your skin holds in more of its moisture, it looks younger and healthier. Aloe vera can be very effective in healing dry skin. Not only does it work as a natural moisturizer, but it has several healing properties that can actually heal dry cracked or flaking skin. Moreover, it stimulates the growth of new cells, and reduces inflammation, all of which can speed up the healing of the dry skin. It can also be effective in treating dry skin caused by conditions such as eczema as well as improving sun damaged skin. Aloe vera is actually an excellent treatment for acne prone skin. The gel from the aloe plant contains two hormones which help to reduce the inflammation and redness that often accompany acne breakouts. In addition, the hormone Gibberellin stimulates the growth of new cells allowing the skin to heal faster with a minimum of scarring. Using Aloe vera daily can reduce the number of breakouts that occur in acne sufferers due to its antiseptic and antifungal properties. However, it should be noted here that it will not cure acne, but it can greatly reduce the inflammation, redness and pain associated with acne breakouts. Depending on the amount of Aloe found in hand and body lotions, it can provide many benefits for the skin. Using a high quality A. vera lotion after you shower may prevent conditions such as athlete’s foot and yeast infections due to this plant’s anti-fungal properties. Besides, several studies have shown that it helps your skin retain much of its natural moisture, leaving it more hydrated, softer and smoother. When used overtime, it may also reduce the visibility of stretch marks and scars. People who use this type of body lotions find that they are very helpful in softening hands, the heels of their feet as well as their elbows and knees. Aloe vera does not only have benefits for your skin but it has some significant benefits for your hair as well. The moisturizing properties of Aloe vera gel has the ability to moisturize both the hair itself and the scalp. In addition, because Aloe does such a great job of healing the skin, it can heal the scalp and even prevent dandruff. This type of gel also coats the hair fibers making hair less frizzy and making detangling after and between washings much easier. And since Aloe contains amino acids and proteins, it can actually strengthen your hair resulting in less breakage and damage. It should be noted however, that the proteins in such a gel may be too much for some types of hair and leave it feeling dry and stiff. Therefore, it is best to check with your hair dresser to see if Aloe vera gel would have the benefits you want for your specific hair type. Finally, do keep in mind that not every Aloe vera product such as Aloe vera Creams or gels will provide healthy benefits for your hair and skin. 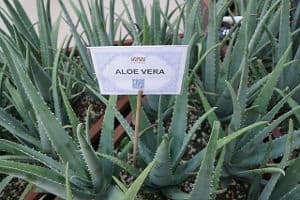 How well a gel or a cream works is going to depend a great deal on the quantity of the Aloe the product actually contains and whether or not it contains synthetic fillers and other cheap ingredients that may take away from the effectiveness of the Aloe Vera and of the other healthy ingredients in the product. Of course, the amount of those cheap chemicals is also important for the effectiveness and the value of the Aloe vera product.